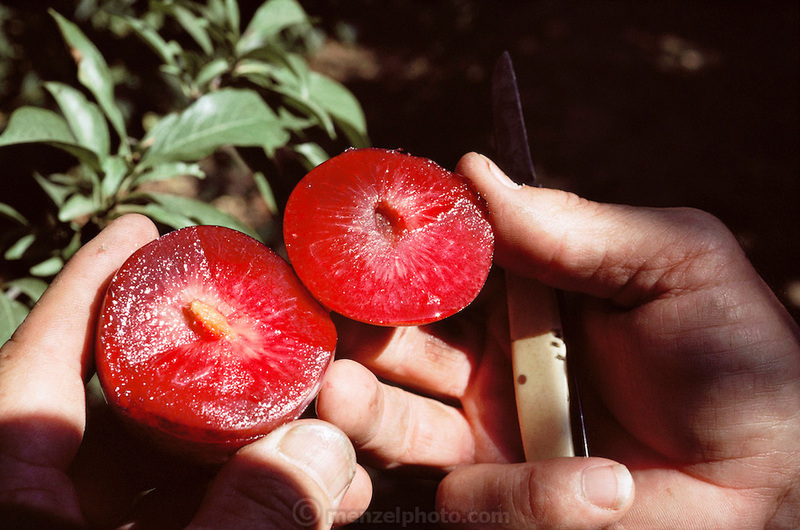 Floyd Zaiger cuts open a "Pluot", a cross between a plum and an apricot, in his orchard. Floyd Zaiger (Born 1926) is a biologist who is most noted for his work in fruit genetics. Zaiger Genetics, located in Modesto, California, USA, was founded in 1958. Zaiger has spent his life in pursuit of the perfect fruit, developing both cultivars of existing species and new hybrids such as the pluot and the aprium. Pluot fruit (plum & apricot) - MODEL RELEASED. 1988.